Turbula - Music - Review of "Radiolarians: The Evolutionary Set"
Most bands achieve some sort of breakthrough commercial success, you can bet the house that they're going to hammer home over and again whatever it was that brought them that success. That's true in jazz as well as more commercial styles; witness The Bad Plus, who now include a cover of a popular rock song on every album. Not so much with pioneering jazz-funk trio Medeski Martin and Wood, though, who not only followed up their successful collaboration with former Miles sideman John Scofield ("Out Louder," 2006) with a series of three experimental albums, but have now re-released that trio of albums with remixes and live versions as a five-CD, two-LP and one-DVD box set. "Radiolarians: The Evolutionary Set" is that rare box set that's not a massive best-of collection; instead, it is an integral part of their catalogue. To be sure it's clearly designed to replace the three separate "Radiolarians" discs, as all three are included here. But with the remix and live discs, plus two LPs (no new songs; just included by the band to offer a different listening experience) and a documentary ("Fly in a Bottle") on the DVD, this is it's own beast. Maybe only George Harrison's three-disc "All Things Must Pass" in 1970 and rock-jazz fusion band Chicago's four-disc live set from 1971 have been as ambitious multi-set recordings. While MMW were always a bit out-there compared to other early-'90s funk-jazz combos, nothing that came before could prepare listeners for what the Radiolarians (a type of single-cell organism) albums offered. They completely abandoned any hint of formula they'd established in the previous 18 years and just went for it: everything from '60s-styled free-form improvisation ("Gwyra Mi") to stuff that sounds like outtakes from The Beatles' White Album ("Reliquary") to a New Orleans' drenched tribute to Professor Longhair ("Professor Nohair") to punk-influenced trance music ("Flat Tires") to stuff so far out there that avant-gardists like Henry Threadgill would either love it or possibly be confused ("ijiji") to a Latin groove ("Jean's Scene"). And sometimes, they just out-funk their early stuff, as on "Won Ton" from "Radiolarians III." 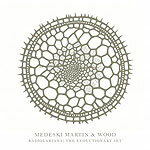 The fourth disc finds them live in concert, performing tracks from the three Radiolarians studio releases. Their ability to balance groove and fluidity in soloing is impressive, as is their willingness to trade the lead on the fly. And they're simply amazing players  something you can't hide in the nakedness of a concert environment. The remix disc is their first since a 1999 EP with remixes with some of their tracks from "Combustication," their first album for Blue Note. But some of the same d.j.s are here: Dan the Automator and D.J. Logic. Most interesting is the fact that both D.J. Logic and D.J. Spooky tackle "Flat Tires," and to very different effect. That 18 years after they first hit the jazz community's consciousness they still have enough creative juice and chutzpah to put out a package this ambitious, and so fully realized, will have MMW's fans wondering what the next couple of decades have in store.